Do you think a DELICIOUS, quick, budget-friendly meal is impossible? Well, it’s not! 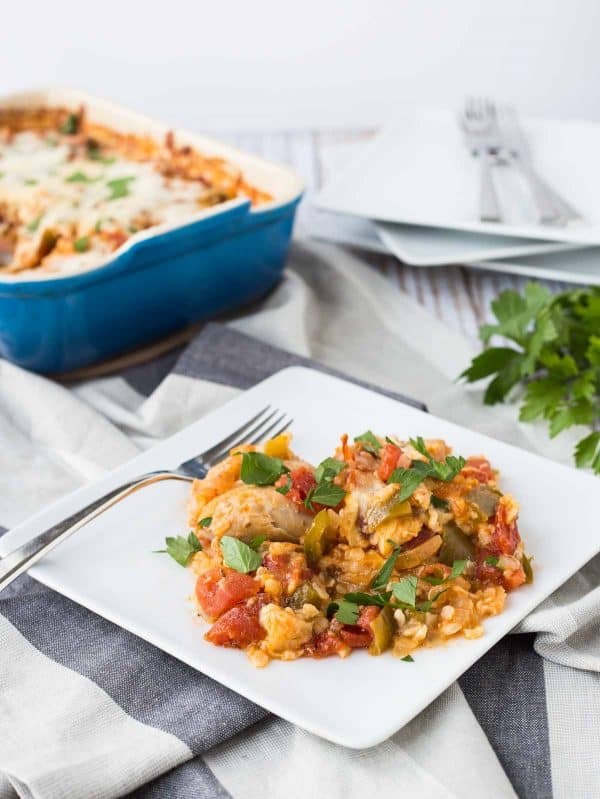 This one dish Italian chicken and rice bake is here to save the day. We’re all moved and settled in our new house yet I feel like things are just getting busier and busier. I guess that’s life though. Ben and I always talk about how funny it is that we thought we were busy before we had kids. Isn’t it funny how that works? I guess it’s all relative. He was a teacher (instead of a principal like he is now) and I was a physical therapist. We’d get up and get ready for work, go to work, get home from work, relax for awhile, go to the gym, eat dinner in front of the TV, and then do whatever we darn well pleased until it was time to go to bed. There was no blog, there were no high school principal hours, and there were no kids. Weekends were mostly free to sleep in and do whatever we wanted. There were no 9am soccer practices or kids crawling in our bed at 6am asking for breakfast. But we were busy. And obviously insane for thinking we were busy. Now? Oh goodness now it just makes my head spin. Get up before the kids, work on my site, get the kids up and get E ready for school. Feed them breakfast, make myself breakfast IF I have time, get E off to school, spend my day with N, squeezing in work when I can, etc. I would go on but we’d be here all day and you’d probably be pretty bored. Moral of the story (sort of) is that I like easy dinners. Bet you couldn’t see that one coming. I’m nothing if not predictable. I also like budget-friendly dinners, because who doesn’t? And do you want to hear the best part about this one dish Italian chicken and rice? It’s not that it only makes one dish dirty, and it’s not that it’s easy on the wallet, and it’s not that it tastes delicious. It’s that buying two cans of Red Gold tomatoes (who I’m proud to partner with!) during the month of October provides two meals to someone in need through their Crush Hunger campaign. So you get to simplify your life, decrease your grocery bill, AND help feed someone in need. Red Gold’s goal is to donate 1.7 million meals to Feeding America food banks across the country. Help spread the word and help crush hunger by sharing this recipe or another favorite…or just tell your family and friends on social media using #HelpCrushHunger. If you share how you’re helping crush hunger using the hashtag #HelpCrushHunger on social media, you’ll be entered to win — the prize is a Red Gold Tomatoes Meal Kit and $100 donated in your name to a local food bank. And don’t forget to stock up on Red Gold Tomatoes at the store this week. You can read here and here why I use their tomatoes, aside from this amazing effort to crush hunger. A little about this easy one dish meal. I used boneless skinless chicken thighs instead of breasts for two reasons. The first reason is because they are more budget-friendly. Secondly, this dish has to cook for quite awhile to make the rice tender. The chicken thighs don’t dry up like chicken breasts might. I used Red Gold Diced Tomatoes with Basil, Garlic and Oregano to keep the ingredient list nice and short — all the flavor you need is in the tomatoes. 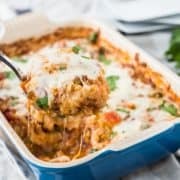 This is similar in some ways to my healthy stuffed pepper casserole, but Ben and I were in agreement that we liked this even better. In a baking dish (9×13 works well), mix together onion, bell pepper, rice, and Red Gold tomatoes. Stir to combine. Add chicken thighs, pushing them down into the tomato mixture. Cover tightly with foil and bake for 75 minutes. Uncover, stir, cover tightly again and bake for 30-50 more minutes or until rice is tender. Uncover, add cheese, and bake for 10 more minutes or until cheese is melted and bubbly. Note: Green bell peppers are typically the most budget-friendly option, but feel free to use your favorite color. Note: You may also use white rice — this will likely decrease cooking time since it cooks faster than brown rice. Try to avoid short grain brown rice or you’ll find that the rice takes even longer to cook. Verdict: Hearty, healthy, and comforting. I’ll definitely be making this Italian chicken and rice again. Husband’s take: He loves this — it’s one of his new favorites I think. Difficulty: Easy. Takes a little planning to get this in the oven nice and early because it does take quite awhile to cook. But that’s all hands-off time. I actually really like that because I get super tired in the late afternoon and early evening so this way I don’t have to worry about standing in the kitchen cooking because I did it all two and half hours before dinner. 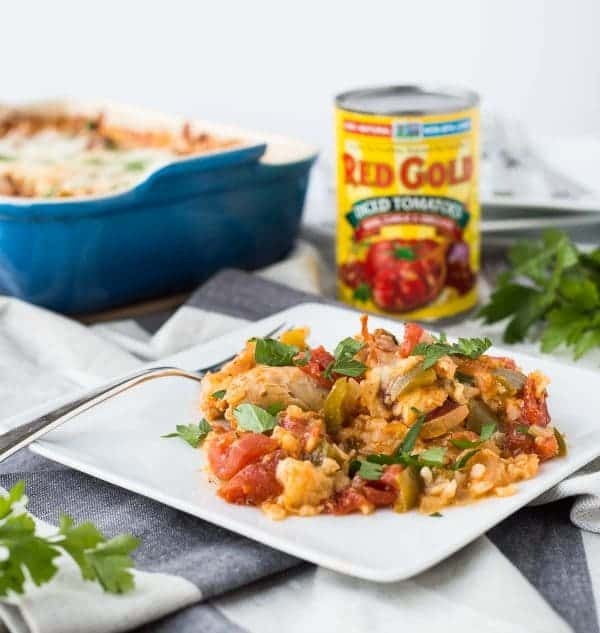 Disclaimer: This One Dish Italian Chicken and Rice Bake was created in connection with Red Gold Tomatoes. Red Gold compensated me for the time required to create this recipe and share it with you. All opinions are always my own. Thank you for supporting my blog by reading about brands I use and love in my own home. 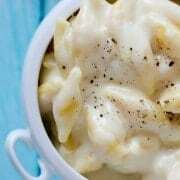 I am making this for dinner tonight. I didn’t have chicken thighs so I diced up chicken breast instead. We will see how it is but it sounds really good and tomatoes are in most of my favorite meals. 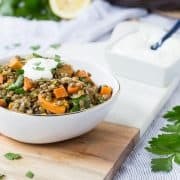 I love one pot easy meals! This is one recipe I will be making very soon. And I like the thought of putting it all in the crock pot. Have you tried making it in the crockpot instead? I would think all day on low it would turn out the same and you wouldnt need to stir in the middle of the bake time. I have not tried it but I bet it would be fantastic! It might end up with slightly more liquid though. I hear ya on the busy that kids bring! I’m always looking for easy one dish meals that I can have on the table in no time at all. My kids would devour this! Congratulations on your new home! This is a comfort food dinner for the win! What a great program. I’m going to look for Red Gold Tomatoes next time I’m at the store. Isn’t it awesome? Thanks Barbara! I always feel so busy and like I’m go, go, go nonstop, so I often wonder what my life will be like when I have kids. Will I get even busier (how is that possible?!) and think I’m crazy for thinking I was busy now?? Or will I just have to re-prioritize?? Probably a combo of both! 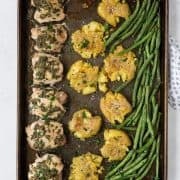 In any event, I’m always up for quick dinners and this one looks delicious!! 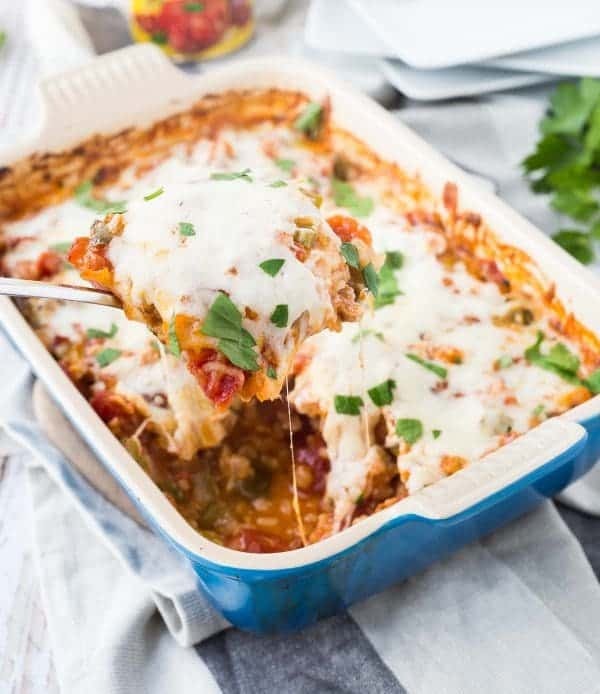 One dish meals are my favorite…AND this is one my kids would love!